As you may know I run a Tuesday evening group and we decided to think outside the box. We wanted to paint something we had never painted before and that was a train. None of us had painted a train before but it turned out to be great fun. We were bouncing ideas of off each other and above is my finished painting. This just goes to show how easy it is to get stuck in a rut and by trying different things this can really improve you as an artist. You can then take what you have learnt and use it else where in your artistic life. We painted this using acrylic paint and when finished overlay the painting with oil paint. This gave a lovely effect and is something I would deffinately do again There is a lot that can be done to it but for my first attempt I was reasonably pleased. Hi everyone would just like to let you know how I got on at the Houghton craft fair. Things started off well as the sun was out and the weather looked good. Where I was situated in the room the sun was beaming down we even had to draw the blinds. Sadly that didn’t last for that long half way through the day it really through it down. It didn’t dampen our spirits though. Both me and other stall holders had a great day and I got my brushes out and started to paint. It was a good day no matter what the weather did. Houghton craft fair is one that I always like to go to. Its a great Christmas fair with lots of different crafts to see. We used to live there so it was nice to see people that we knew years ago. Its always nice to catch up and talk. The sun came out again in the afternoon it was so busy too. I managed to sell one of the paintings of the easel still wet. Also I got a commission for another Poppy painting. I really enjoyed my day at the craft fair and will return next year. My next Christmas fair is in South Wigston on December 2nd which is a Saturday. if you would like to learn this way of painting please give me a call or visit my website. Walk in the woods workshop is this Friday 26th October and I have a couple spaces spare. If you would like to have a go at this workshop then please let me know. You can do this through my website or just give me a call 07483869591. 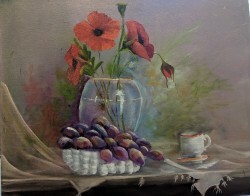 This is a great workshop and we will use the wet on wet painting technique using good old oil paint. The cost of the workshop is £45-00 and all of the materials are supplied. All you would need to bring with you is your lunch and an apron and some paper towels. This is a wonderful opportunity not only to learn this fabulous way of painting. Also you can obtain workshop vouchers from me which make a great gift idea. Hi everyone you know you’ve always had it at the back of your mind I would like to paint. Well now you can I can teach you the wet on wet method of painting. In just one day on my workshop I will teach you all I know about painting using oil paint. Many people that have come to my workshops have said that they have always wanted to do this. Or they have had it on there bucket list of things to do. My workshops are from 10.am to 4 pm. In that time we will start a painting and finish it in that one session. All of my workshops cost £45-00 and all of the materials are included. The only things you would need to bring with you is your lunch an apron and some paper towels. My aim is to pass on what I have learnt over the years. So you to can enjoy this fabulous hobby and create wonderful artwork. 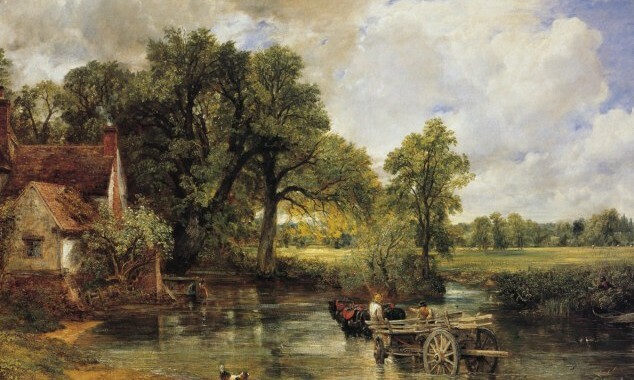 Anyone can paint like this and once you have learnt this technique you can paint anything. The image I have posted is the sort of things that you will be able to do. Please take a look at my website where there are many more paintings to choose from . 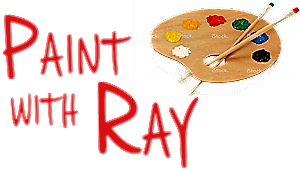 Take a look and see what you would like to paint. If there is nothing you would like to learn then please give me a ring. I will try to fit in with you so you can learn this way of painting. How I would paint a still life. Still Life well this is a subject that I have never wanted to do. Its also a subject that I knew nothing about what the procedures were in making a still life. This meant I would always skip by still life it didn’t interest me at all. One day I was in my studio did not know what to paint. So I stuck to what I knew best Landscapes. Well that didn’t work for me either. I just got a cloth and wiped it off smudging all the different colours together. It looked a right mess and I was just about to scrape the paint off so I could reuse the canvas for something else when. I looked at the canvas and thought that makes a great background for a flower. I don’t know why but I started to paint a still life my first ever and I didn’t know why I was doing it I had not got a picture to follow. This was amazing for me, but I was really enjoying it. Completely out of my comfort zone but I carried on with it. Gradually it was coming together. I was always looking at it and thinking what else do I need to add. I did add more but decided that less was more. Your views are very welcome. I think that it has taught me not to limit myself. Just because I had never done this before shouldn’t deter me from trying. It may not be the best still life ever but I so enjoyed it. It will be something I do more of in the future. How to paint a flower many people ask me that question. Well in this and another newsletter I will try and show you how I set about painting a flower. There are many ways to paint flowers but this is how I do it. First find yourself a good quality photo of the flower you want to paint. Then decide on a background to put your flower against. 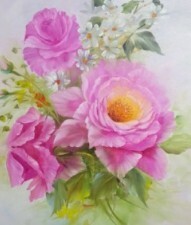 Usually an out of focus background as the flower is the star of the painting. I usually say for your first painting try a poppy as it does not have to many petals. Petal placement can be a nightmare so I would say a poppy is a good place to start. We can move onto a rose later. Note the soft back ground and the blended green area. We don’t want any hard edges we blend the green into the back ground photo 1. 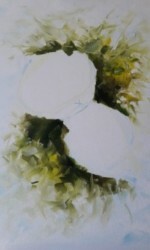 This is how I start every flower painting note the two oval unpainted areas. This is where my flowers are going to be. In painting 2 you can see where I have added some more leaves in. I will add more at the end of the painting If I think they are needed. In my next News Letter I will speak more about how to form the flowers themselves. Creating the shadows and finish the painting off with our detail. This detail will really bring your painting fully to life. and to teach bob Ross class’s. Rose painting using oil paint. This is a trip that I have been looking forward to for some time now. I want to have a go at painting Roses the really open sort. I want to learn to get looser with my floral paintings. So with this in mind I am going down to Gloucestershire to paint with Karen Underwood who is a fantastic artist. Also I was teaching the Bob Ross method to a gentleman from Spain while I was there with Karen. His wife was painting flowers with Karen. The idea is I paint one day using Bob Ross method with Len and one day with his wife and Karen painting flowers. Well as you can imagine as the time got closer I got a little more nervous on meeting these two from Spain. Well I need not have worried we met on day one and hit it of straight away. They were a really lovely couple and I very much enjoyed my time with them. I thought that Len had made a really great job with both of his paintings. I was teaching in Karen Underwood’s studio. Karen was teaching how to paint flowers and I was teaching the Bob Ross Technique. Karen is a fantastic teacher I really enjoy painting with her. Well we started on day one I asked Len if he had a painting in mind that he would like to do. He said he was not bothered just the typical Bob Ross scene, So we made it up as we went along. This I always find is a fantastic way to paint. With this in mind we decided to paint a summer scene and a daylight scene the rest came as we went on. We would start with the sky then we would add our mountains and the water all as we went on. It was a great days painting and we had such a laugh. On day two I painted with Karen her brief was I did not mind what I painted I just wanted to be a little looser. This was another great day for painting but also such a fun day as well. On the third day I was teaching Len again, and again we made it up as we went along. We painted a snow scene which also was another very enjoyable day. All in all a very good 3 days painting and lots fun and two new friends. Can’t wait to do this again thank you Karen for the hospitality and great instruction you gave.